My breed was originally developed as a cattle dog, but as that kind of work is hard to come by these days, I usually work as a guard dog and police dog. As my name implies, I am no little whipper-snapper. In addition to being a quick-thinker, I am one of the hardiest working breeds known to man. I can also stay fit with less outdoor exercise than other large breeds and I have more common sense than most dogs, which means that I require somewhat less formal training to learn the rules. When fully grown, I am between 23.5 and 27.5 inches tall (59.7 to 69.8 centimeters) and I weigh between 70 and 80 pounds (31.5 to 36 kilograms). 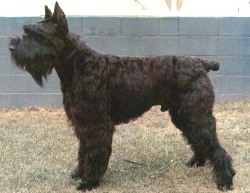 We have no Giant Schnauzer Breeders listed at this time. Click here to place your Giant Schnauzer Ad!